What we usually hear about the Renaissance is that it was a period in history that came after the Middle Ages with a growing economy, early investigations of the universe and an upliving (“rebirth”) of the classical antiquitiy in art and literature. The invention of bookprinting also resulted in a much faster spreading of new ideas to a wider audience. About these ideas many people don’t know much though. In academic circles there have been available writings of or about for example Marsilio Ficino (1433-1499) or Giordano Bruno (1548-1600), but it was mainly Frances Amelia Yates (1890-1981) who also wrote for a larger audience. Subjects of Yates include the early Christian Cabala, the Hermetic tradition, the named thinkers or “the occult philosophy in the Elizabethan age”. Later also writers such as Michael Baigent (1948-) and Richard Leigh (1943-2007) picked up such subjects, but they had a much more populistic approach. Because more and more texts, translations and information becomes available about this very interesting part of our history which seems to be coming after a still growing interest in Hermetism, Gnosticism and alchemy of recent times, I thought it would be a good idea to make you acquainted with the philosophical Renaissance. It began in Italy and reached the rest of Europe via Hungary. In this article I will focus on Italy, because there is enough to tell about that. The rest of Europe will come in a separate article. The Middle Ages are characterised by a high level of dogmatism of the Christian doctrine and the theological foundation and proving of it. This theology is called “scholasticism”. To force submission from the folk, the inquisition was founded in 1231. As we will see, this institution has existed all through the Renaissance. Still there came a bit more freedom and open-mindedness. Following thinkers such as Francesco Petrarca (1304-1374) and Giovani Boccaccio (1313-1375), humanism originated. This is a philosophy reverting to classical texts and placing man in the middle of creation. The reason for the first point was the same as with the scholasticists, but the humanists were of the opinion that in the Middle Ages the theologians had strayed away from their sources. As time passed humanism became less theological and more rational and more and more ‘human-centered’ than ‘God-centered’. Especially Greek texts were unravelled, but here and there also other texts and thinkers. A revival came when freethinkers from Byzantium were forced to leave when the Turks took over the near East and middle Asia in 1453 and ended an imperium that has existed since 660BC. Many of the mentioned thinkers moved to Greek and Italy. In this last country the city of Florence underwent a peak in it’s economical growth. Florence was founded by Julius Ceasar (100-44BC) as a fortress and later became a small town. For about 1000 years Florence slowly grew to a peak. Several times there was a new government, but from 1250 on things went very well. Many merchants settled down in the city, one family of which was that of De Medici who owned a large network of banks and had considerable fortune. They built villas and other buildings in Florence and in 1253 Cosimo de Medici (1389-1464) even came to rule Florence. Cosimo had good trading and management skills, but also a big interest in philosophy. As a rich humanist in his time behooved, Cosimo was an enthousiastic collector of original classical texts. Like others he had several people travelling around looking for books to enlarge his rich library. In 1438 a council was held in Ferrara to try to bring the Eastern and Western Christian churches more on one line. This council was a failure, but Cosimo organised a new one in Florence in 1439. One of the spokesman was George Gemistos (1360-1452), better known as “Plethon” (‘the new Plato). Plethon was one of the first churchfathers who openly spoke about his admiration for Plato (427-347 BC). He was one of those who fled from Byzantium about who I spoke earlier. Plato wasn’t quite a beloved person from the past in those times. Not only there were hardly any texts available in Latin, but also the church regarded him as heathen. Quite different things were with Plato’s student Aristotle (389-322 BC) whose teachings were already incorporated in the Christian doctrines by the Medieval theologist Thomas Aquinas (±1225-1274). Plethon and especially his student Johannes Bessarion (1403-1472) would also incorporate Plato in the Christian world of thought. Of course this didn’t happen in a day. Cosimo was so impressed by the lectures about Plato that he took up the plan to start a ‘Platonic academy’. It would take a fews years before this really happened though. Cosimo had a family doctor named Diotifeci d’Angelo Ficino (?-±1477) of who one son was the famous Marsilio. Marsilio already visited the De Medici family at an early age. However he would first follow his father in practise, Cosimo rose an interest in the philosophy of the divine Plato. Ficino proved to be very gifted and soon started to make translations for Cosimo. The plan was to translate the entire works of Plato and the neoplatonist Plotinus (204-270) to Latin. This was shortly interrupted by the finding and translation of the Corpus Hermeticum (see my articles about the Hermetic Tradition). Besides this massive translative-work Ficino wrote a massive amounts of books, essays and letters in the 66 years of his life. Letters especially, because Ficino never travelled, but he was in contact with many people all around the world. Of every letter Ficino kept a copy for himself and five years for his death he wrote an introduction to them. After he passed away, Ficino’s letters were published in twelve books. Parts of these are available in other languages than Latin as well. Ficino was a real ‘uomo universale’, a popular term for people from the Renaissance, but especially fitting for Ficino. As mentioned he started to study medicine. In his time 25% of this study was astrology. Further he was very well-read and acquainted with classical mythology and philosophy, but also churchfathers of his own time and before. He was a esteemed musician and writer of a wide variety of subjects. You can think off about everything between magic and theology and philosophy, but also medicine, health, early science, astronony, astrology, psychology, politics and leadership and everyday life. Ficino put a lot of stress on love and friendship. The Platonic academy was founded by Cosimo de Medici in 1462. Also after Cosimo’s death Ficino was leader of the academy. Ficino’s fame spread around the globe. People from far places came to Florence to listen to him and handwritten copies his writings first circulated under the richer interested. After the invention of bookpressing Ficino much faster reached a much larger audience though. The history of the academy hasn’t been free of problems, but I don’t want to go into this too deeply. Shortly I will mention the deaths of a few De Medici’s that Ficino outlived (sons followed up their father at the bank and the academy); the attempt to chase away the De Medici’s from Florence with the help of the Vatican in 1478 and eventually Ficino himself who had to defend himself against the church even though he had become a Dominican priest in 1473. Ironically enough the Dominican order was founded in the 13th century to test people and groups on their Christianity and their conclusions were often used by the inquisition. I suppose this was not as much the case in Ficino’s time, otherwise I can’t imagine him joining. One of the friends of Ficino who would become a rising star on the philosophical plane is the quite well-known Giovani Pico della Mirandola (1463-1494). At first he was a follower of Aristotle, but to Ficino’s delight, he later turned towards the divine Plato. In contradiction to Ficino, Pico travelled all around Europe and studied on several big universities. Pico is mainly known for his preface “About human dignity” (1486) to his 900 statements that he wanted to defend against the church of Rome. Pico took these statements from a variety of sources, also sources that the church didn’t appreciate much, like the Hermetic writings. However the discussion never took place and only 3 of the 900 statements were declared heathen, Pico never more received the grace of the church. Besides philosophical influences the academy and her ideas also had influence on the art and culture in Florence and elsewhere. Yet it was not until after Ficino’s death that also people with another primary interest than philosophy joined the academy. The best-known example is of course Leonardo da Vinci (1452-1519). 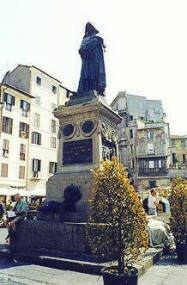 The next best-known Italian thinker from the Renaissance is Giordano Bruno, but between hem en Ficino there is quite a gap. In this periode you can see some interesting developments, such as on the political-philsophical plane or early science. This last thing is of course well in line with the growing rationalism of the time. Because the information here is mostly scarce, I will speak about this periode shortly. To start in the political corner, I of course can’t make it to not mention the famous Nicolò Machiavelli (1469-1527). He started his carreer in the political Florence of 1498. He mostly gained recognition with his political-philosophical writings that were not afflicted by the popular neoplatonism of his time. Besides this Machiavelli was a good (political) historian. He thought that history repeats itself over and over and he tried to explain events in the present by comparing them to events in the past. One of his ideas that caused quite a stir, was that he was of the opinion that not the church, but the state had to be in charge of a nation. Also Machiavelli wrote stories. Francesco Guicciardini (1521 – 1589) can be compared with Machiavelli in more than one sence. Also he was political scientist, but as you can see he lived some time after Machiavelli. Therefor he could continue the path that Machiavelli started. Besides politicians there were also a couple of ‘naturalists’ in Italy in that time. Naturalists explored nature in all its facets with led to early-scientific experiments and investigations. Two names that I want to mention are Bernardo Thelesio (1508-1588) and Francesco Patrizzi (1529-1591). Hieronymus Cordanus (1500-1536) went further than the previous two. Besides nature and early science, Cordanus was involved in medicine, but also for example alchemy. This caused him often being called the Italian counterpart of the Swiss Paracelsus (1493-1541). That Plato didn’t entirely rule the minds of the philsophers is proven by Pietro Pomponazzi (1462-1525) who lead an Aristotelic school. The battle between the followers of Plato and his student Aristotle continued. Unfortunately not too much information can be found about the interesting subject of the Christian Cabala. Some say that this was a typical Renaissance-phenomenon. It actually came quite quickly after the ‘original’ version, the Jewish Kabbalah. This last may be based on a centuries-long tradition, but was not really crystallised before the time that the Muslims ruled Spain, where a lot of Jews lived at that time. This was in the 15th century and also around the end of this very century people like the mentioned Pico, Bruno or for example Francesco di Giorgio Martini (1439-1502) were working on a more Christian version of it. The way the words are written is to keep the two versions apart. Bruno was born as Filippo in the small village of Nola, that can be found about 30 kms from Napels. He was a real child of the Renaissance that has spread all over Europe in his time. Especially in the England of queen Elizabeth (1533-1603) there was a big revival. Also Bruno joined a Dominican order in 1565 and took the name Giordano. Because of his critical mentality he didn’t make much friends and felt forced to leave. After this he travelled all across Europe and most of the times him being critical gave him problems and caused him to have to leave again. First Bruno was in Switserland and then in France. Here he caught the attention of king Henri III. In 1583 he was in London and Oxford, but also here he wasn’t welcomed with overwhelming enthousiasm. Especially his anti-Aristotelic and pro-Copernical theories (especially the Oxford university still as was an Aristotle bastion at that time) gave him problems. Still it was in this English periode that Bruno wrote his quite well-known ‘Italian Dialogues’. In contradiction to most texts of Bruno there were not written in Latin, but in his native language. Also in contradiction to his texts in Latin, the Italian Dialogues were not much of a magical nature, but very philosophical and esthetic. Both because of his rebelish ideas but also the (just) accusition of plagiarism of Ficino Bruno thought it was a better idea to go back to France. In 1586 he was already in Germany with a short visit to the ‘Hermetic emperor’ Rudolf II in Prague and in 1591 he arrived back in his home country. He tried to conciliate with the Roman church, but instead he fell in the hands of the inquisition. In more than one sence Bruno followed the medieval philosopher and magician Ramon Lull (1232-1361). Bruno heavenly leaned agains Lull’s art of memory (‘mnemonism’). Bruno followed Lull’s idea that memory is determined by the manipulation and combination of images. This is why their art of memory is often called ‘ars combinatoria’ or the art of combining. Both Lull and Bruno worked on different technicques to train the memory. Further both men are regarded as the predecessors of ‘pansofism’, a pantheistic philosophy. Bruno’s Italian Dialogue “About the cause, the principle and the one” (“De la causa, principio et uno”) part V is a long disquisition about the endlessness of the universe that is “undefinable and unboundable”. Bruno’s expression “all things exist in the universe and the universe exists in all things” sounds very pantheistic. Especially this was to become Bruno’s biggest problem. During his last stay in Italy Bruno was picked up by the inquisition which was followed by a seven-year imprisonment and eventually our friend was burned at the stake on the Campo de Fiori in Rome in 1600. Until today a bronze statue of Bruno can be found there. Partly because of his end Bruno has always been relatively well-known in Italy and under freethinkers in the rest of the world. Because of this Bruno’s very original ideas have had their influence and his writings have been fairly accessible in their original languages. Still it is quite new that translations make Bruno accessible for a bigger audience as well. After Bruno the highlight of the Renaissance can be especially found outside Italy, which may be something for another article. Hi, congratualtions on your website, I like your work keep it up. However I am a little concerned about your dates in the third paragraph of this article, you have, for example, Cosimo making decisions long after his death, a slip of the pen no doubt, but confusing. I feel you have treated Cosimo lightly. He was far more of an inspiration and driving force than you seem to be suggesting. He was the brains, and financier behind the the Academy, Careggi (not sure how its spelt) was his country house, which he made available to the Academy. Ficino, and many others there, were sponsored, paid, by him – before and after Cosimo’s death. The redisovered ancient works, which Cosimo had his agents seek out, and he paid for, were in my view from much reading, the true triggers of the renaissance. Typos for sure, the council of Ferrara was not in 1488 but in 1438 and ‘Cosimo’s council’ in 1439 instead of 1489. Thank you for noticing me. yes yes yes yes!!! you’re a fan of Joseph Dan!!! !